On behalf of all of us at our Ford dealership in Valpo, IN, we want to thank you for your service to our country. We believe that those who serve in the military are true heroes, and we can't thank you enough for the sacrifices you've made. As our way of showing our appreciation for your bravery, we're proud to offer military personnel and their families a military bonus cash offer on new Ford vehicles. 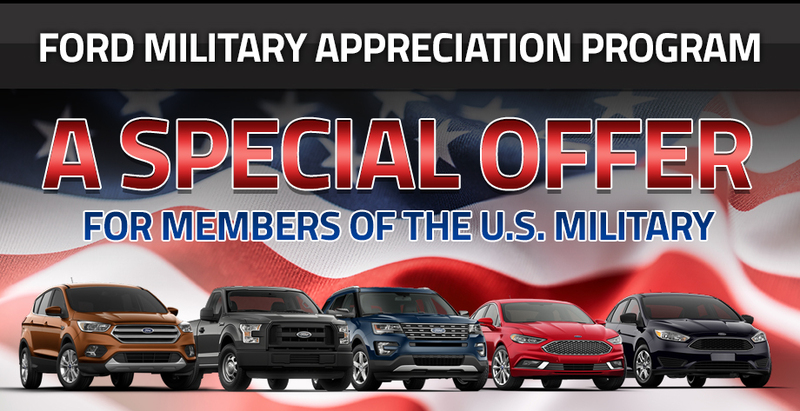 Ford salutes those who serve by offering a military appreciation bonus cash discount to members of U.S. Military Branches including active military personnel in the Army, Navy, Air Force, Marines, Coast Guard and National Guard. Additionally, reservists serving on active duty, members of the Delayed Entry/Enlistment Program (DEP), Veterans within 24 months of separation, retirees, spouse/surviving spouses and other household members, who are residents of the United States, can be eligible to take part in this incredible program. Learn more about eligibility below, and then visit Ford of Valpo when you're ready to start shopping for your next Ford vehicle. From new Ford F-150 trucks to Ford Escape SUVs, we have something for everyone!